On Monday, the water level in the River Seine in the French capital rose to a mark of 5.8 meters, which was a peak for the time of high water. 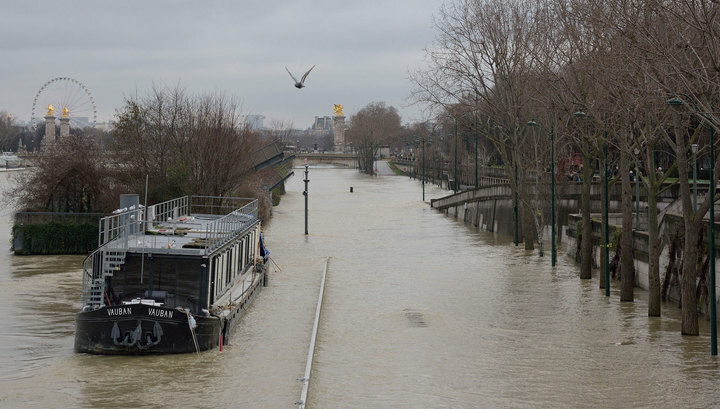 According to weather forecasters, at this level the water in the Seine will last until Tuesday, after which the situation will return to normal. As previously reported, because of the flood from Paris evacuated about 1.5 thousand people, about a hundred homes were left without electricity. In addition, the movement of river transport has been suspended in Paris, the stations of the high-speed railway line RER C have been closed. At the weekend, due to the threat of flooding in one of the most famous museums in France – the Louvre – the lower halls were closed. The emergency plan for the salvation of objects of art brought into use the leadership of the Museum of Orsay. The increased – orange hazard level continues to operate due to the floods in 11 French departments, including the Seine and the Marne, the Ode de Saint-Seine and the Val de Marne. During the observation of meteorologists, the period from December to January was the third rainiest time since1900.